As climate change is increasingly recognized as a “threat multiplier” by scientists, political representatives, and civil society across the world, the United Nations Security Council held an open debate on Friday to discuss its concrete impact on peace and security, and focus on tangible ways to diminish the effects of global warming. “The relationship between climate-related risks and conflict is complex and often intersects with political, social, economic and demographic factors,” said Rosemary DiCarlo, the Under-Secretary-General for Political and Peacebuilding Affairs in her opening remarks. “The risks associated with climate-related disasters do not represent a scenario of some distant future. They are already a reality for millions of people around the globe – and they are not going away,” she stressed. The meeting took place almost two months after 197 parties to the UN Climate Change Convention agreed to a concrete way forward on implementing the 2015 Paris Agreement – which aims to keep global warming under 1.5°C from pre-industrial levels – and ahead of the UN Secretary-General’s Climate Summit, convened for 23 September this year. Climate risk: to debate or not to debate? Whether climate change is an issue that should be examined by the UN’s peace and security body to begin with, has been the subject of controversy. Some Member States believe that this is stepping on the toes of other UN entities, specifically mandated with taking a lead on social and economic development, or environmental protection. The first ever meeting of the Security Council examining the linkages between climate change and insecurity happened in April 2007. Since then, the UN body has increasingly taken steps that effectively acknowledge that the two issues are related: in July 2011, another open debate on the matter was held; in March 2017, resolution 2349 was adopted highlighting the need to address climate-related risks in order to tackle the conflict in the Lake Chad basin; and in July 2018, a debate was held on “understanding and addressing climate-related security risks”. In a sign of how important the discussion is to many countries, the debate was attended by over 70 Member States and included statements in the Council chamber from a dozen Ministers, including Kuwait, Belgium, Indonesia, Germany and Poland. Developing stronger analytical capacity with integrated risk assessment frameworks. Collecting stronger evidence base so good practices on climate risk prevention and management can be replicated in the field. Building and reinforcing partnerships to leverage existing capacities within and outside the UN system. “Most important, for all of us, is the recognition that deeds must follow words. Major armies and businesses have long recognized the need to prepare for climate-related risks, rightfully assessing climate change as a threat multiplier,” said the UN Political Affairs chief. “We cannot lag behind. We must act now, with a sense of urgency and a commitment to place people, especially those most marginalized and vulnerable, at the centre of our efforts,” she stated. Mr. Steiner cited some of the hundreds of projects carried out by UNDP in some 140 countries, including a water management system in the Maldives, the development of a vulnerability index to facilitate preparedness, and a financial support scheme for vulnerable households in the Caribbean. He noted that WMO stands ready to support the UN and Member States with “cutting-edge science” and “expert information” so informed decisions can be made. Before the floor was opened to Members of the Security Council, a youth representative and a researcher on environmental security, Lindsay Getschel, was also invited to speak. A resolution officially recognizing climate change as a threat to international peace and security. An assessment on how climate change impacts local youth (e.g., through displacement, unemployment, food insecurity, and recruitment in armed groups). A reduction of reliance on fossil fuel energy in UN missions worldwide and a commitment 50 per cent of energy used to be from renewable sources by 2025, with regular reporting to the Secretary-General to monitor progress. 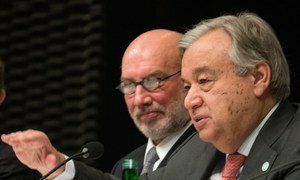 With thousands gathered in Katowice, Poland, for the ‘COP24’ meeting to chart the way forward for climate action, United Nations chief António Guterres presented his longer-term vision on Tuesday for the 2019 Climate Change Summit. 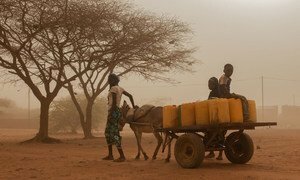 Climate change ­– and the shortages of water and food that come from it – is becoming increasingly linked to conflict, a senior United Nations official told the Security Council on Wednesday, warning that countries most vulnerable to drought and crop failure are also most vulnerable to conflict and fragility.